We are moving on up! Don’t get too excited we are still in no position to start building but, we had to come to terms with the limited space in or tiny trailer. I love our little camper. We put so much work and love into that little camper, and I dreamed of having it for a long time. However, it’s a challenging space to live in full time. I think it would be different if it were just us but, with three dogs it gets a little crazy sometimes. All that to say we are moving into a larger camper. The good news is that there’s another camper revamp in my future. We discussed getting a new camper to death. I did not want to have to sell or little home. 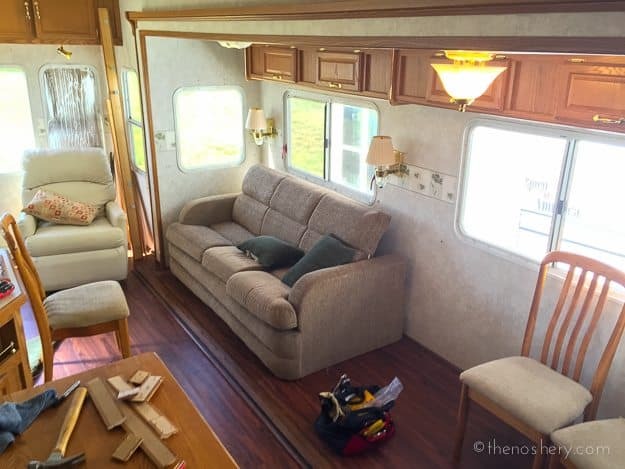 I stressed and anguished over the decision but when we came across the perfect used camper, I knew it was time. 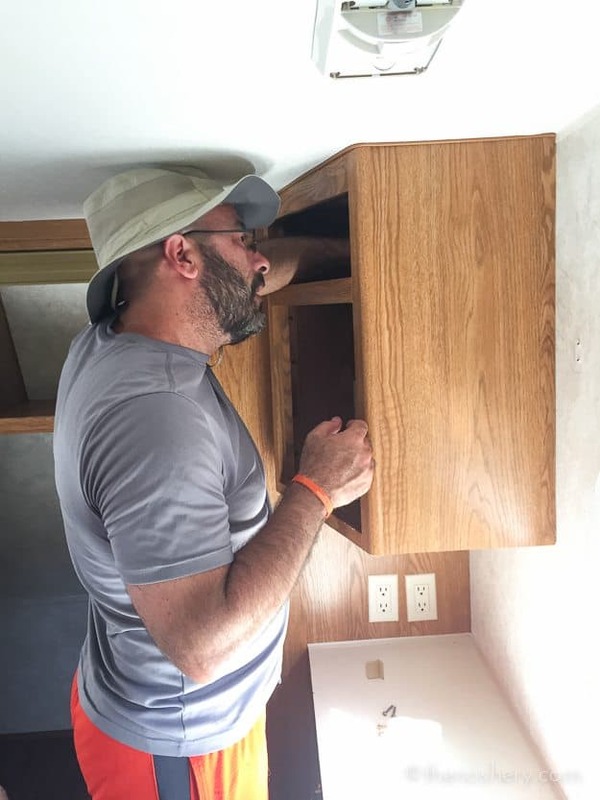 It will be a few weeks until we will move in, so we will continue to stay in our little camper for now. I’m planning on doing some painting and redecorating to our new home before moving. 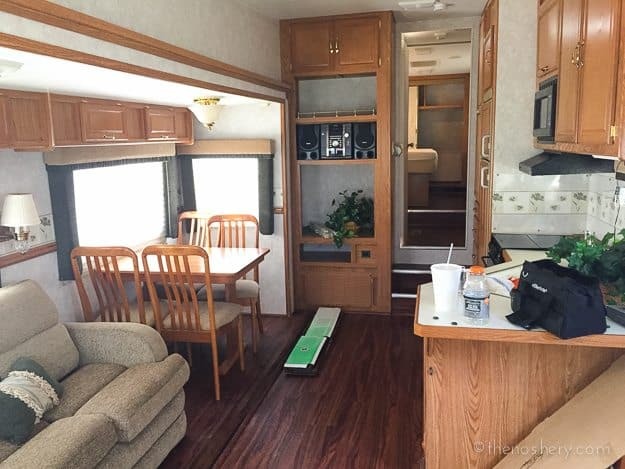 In the mean time let do a quick tour our the new camper! 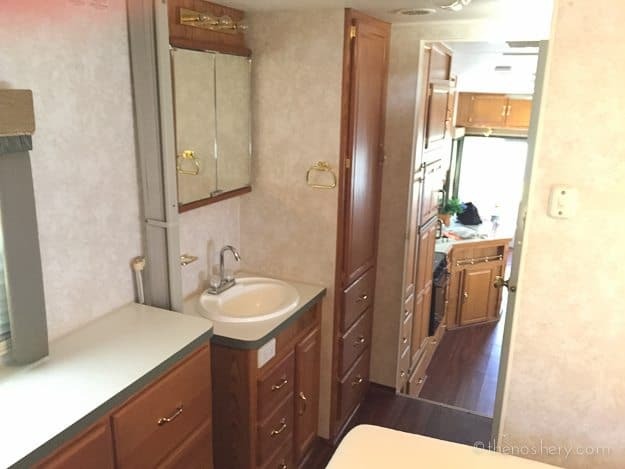 We got a 2002 Fleetwood Wilderness fifth wheel with two slide outs. We lucked out that the previous owner ripped out all the carpet and put new vinyl floors. It’s one of the main reasons we chose this camper. The slide out makes all the difference when it comes to space. I plan on painting the walls and cabinets white and changing out all the furniture. If you’re in the Dallas/Fort Worth area, all the furniture is for sale. All furniture must go! I’m considering painting an accent wall a dark charcoal. 😀 My first plan of attack, however, is it to remove all the lovely green carpeted valences front the windows and the wood wall trim. We are also planning on changing the kitchen counter top and sink. I want a sink that under mounted and can be covered so; it lays flush on the counter top. I am all about optimizing my kitchen counter space. In the bedroom, I will do something a little different with the paint. The walls will be white, cabinets a dark charcoal and a color accent at the head of the bed. What I haven’t figured out yet is what to do with the lovely light fixtures. (Insert sarcasm here) I can’t change them out because they are specially made for campers and all the replacements I’ve seen I hate. 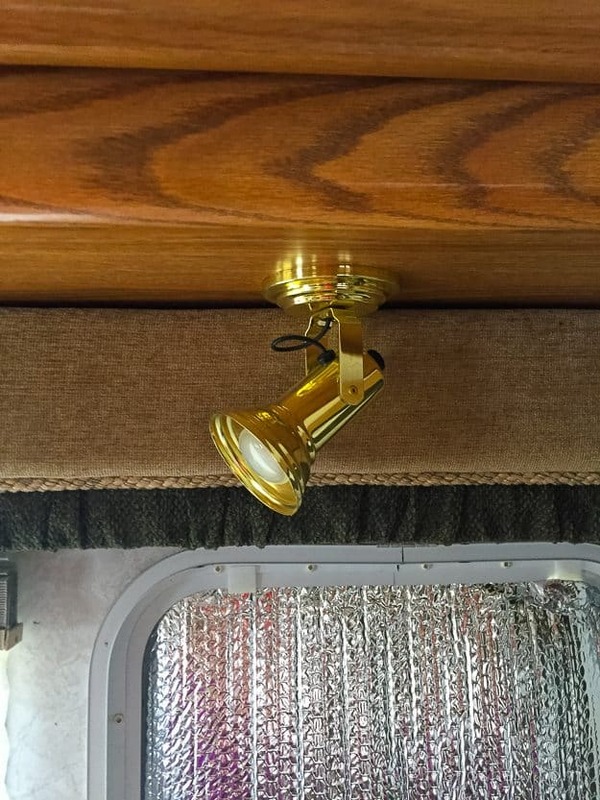 I’m thinking if I change out the shade and do something fun with paint on the fixture; it may work. Any ideas are welcome! This brass beauty will be easier to change up. Hit is with some nickel finish paint, and it should be good to go. 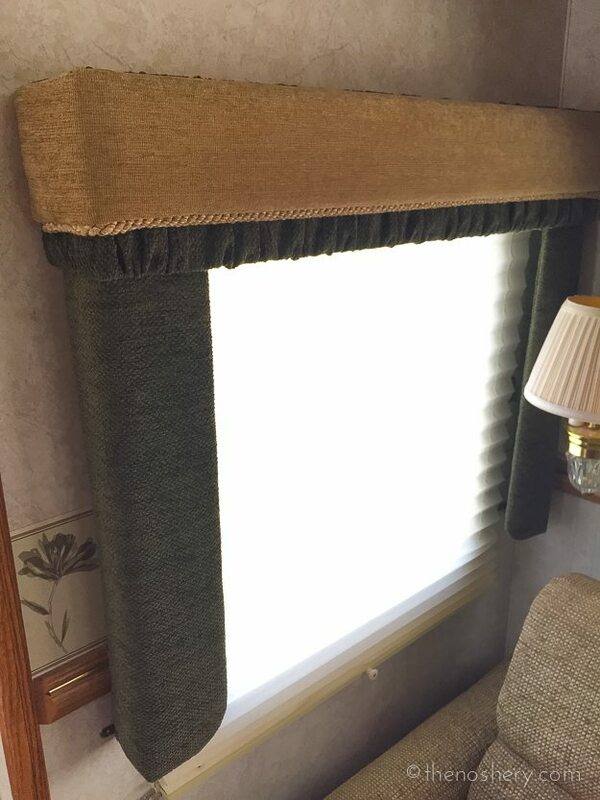 Right now what is causing the most pain to my eyeballs are the lovely heavily upholstered valances. I don’t understand the logic behind these! Not only are they not cute but, all I can see when I look at them is dog hair magnet. So, we took them all down! It’s looks better already doesn’t it! We are holding on to the blinds to repurpose them but, the valences are currently taking a dive in the dumpster. I also was happy to discover the wood detail that ran along the wall was tacked in. It was easy to remove with a flathead screwdriver and a hammer. The next step is to remove the lovely border and prep the walls for paint! YEAH! We were going to call it a day and then my handyman went poking around the lovely TV cabinet in the bedroom. At first glance, it looks like all we had to do was unscrew it from the wall. But, after removing all the visible screws it was still holding on. We tapped a paint scraper between the cabinet and ceiling and slowly pried away from the ceiling. What we discovered was that it had been stapled through the ceiling. Using the hammer we tapped the staple back up through the ceiling and will touch it up later. All the matters are that the circa 2002 TV cabinet is gone! Yippee! It’s the very beginning stages but, I am excited to get the ball rolling. Over the next few weeks, we will be busy painting, doing small repairs, and I will be on the hunt for new furniture and accessories. EEEK! I’m so excited! Next to cooking, decorating is my favorite thing to do!! Thanks for this. 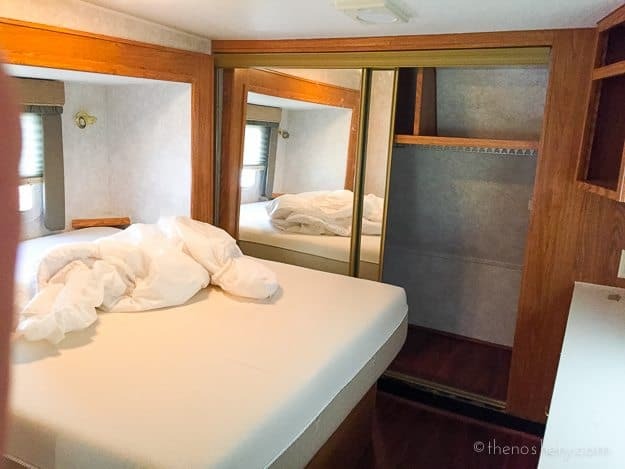 I just started looking for a new mattress for this type of camper home, and yours is one of the few sane opinions i’ve come across. How do I look up the finished 5th wheel? I just found your blog through the tiny kitchen post on PW that someone shared on Facebook. We live just north of Dallas!! But, there are 8 of us so a tiny trailer is not an option for now. Although, I do absolutely love this idea. How great for your new space! It’s lovely. Can’t wait to follow along. This is so exciting! I am still in awe when I look back at your first remodel. I have thought a thousand time how much I’d like to downsize from our big house into a large travel trailer. The cost of living in NYS is maddening. While it makes sense to me – convincing hubby of that is another story 🙂 I still own the Pink Paradise and after a few more recent modifications we are finally taking her on her first road trip – yay! 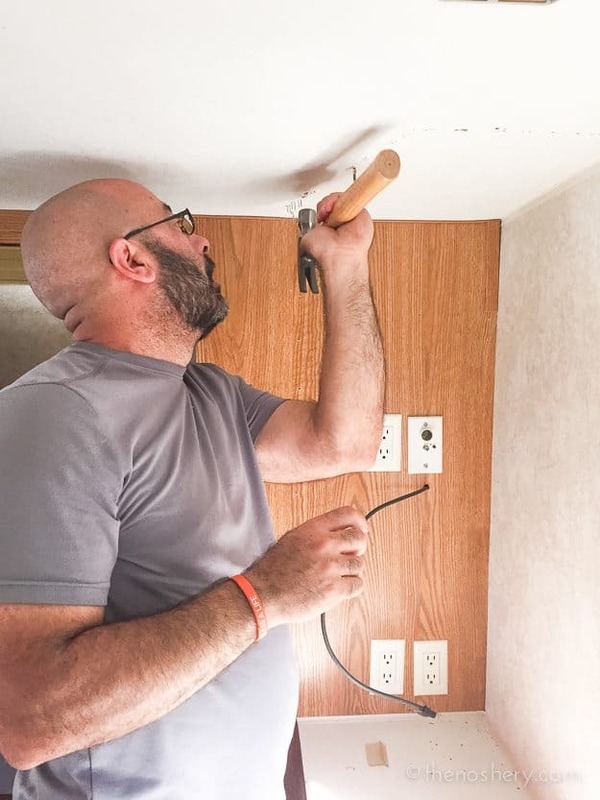 I’m tuning in to see how your newest project goes! Wow, that’s a lot more room! Love it! 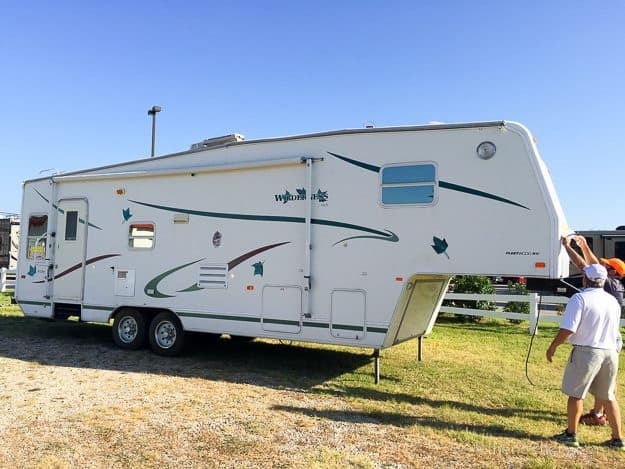 We lived in a 5th wheel for several years since we were moving around a lot and it was just easier to take our home with us. We bought new living room chairs and added a big desk for my office but finding a couch that would fit through the door proved impossible. I hated that thing. I think the valances are partly a misguided attempt at decorating and partly an effort to keep cold winds out. Ours weren’t too ugly so we left them in. 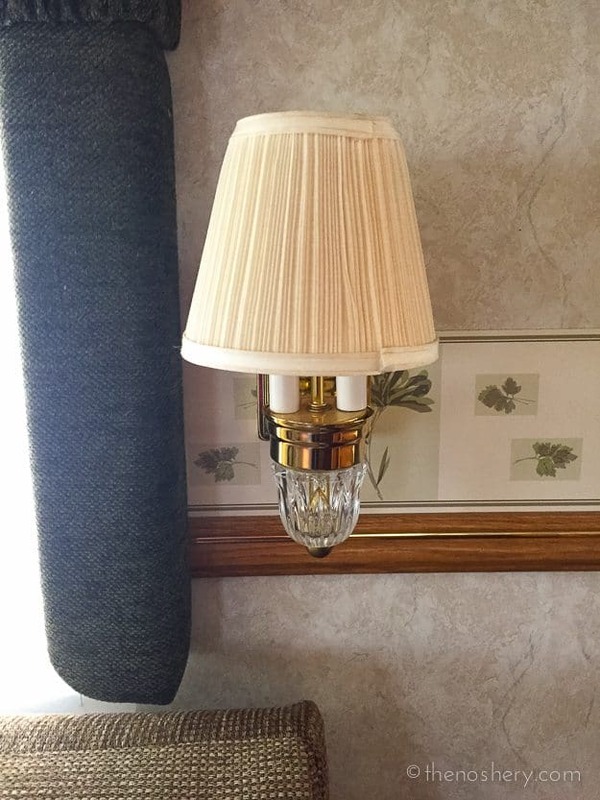 The lamps were a downer for me, too, but since we were moving around it didn’t make sense to replace them – they’re lightweight and they don’t move when you’re moving down the road. We bought an awning with a zip-on sunroom that was wonderful for extra space. If you have a washer/dryer hookup in the closet, a European washer/dryer unit (not stacked – a single unit that washes and dries) can be a godsend. 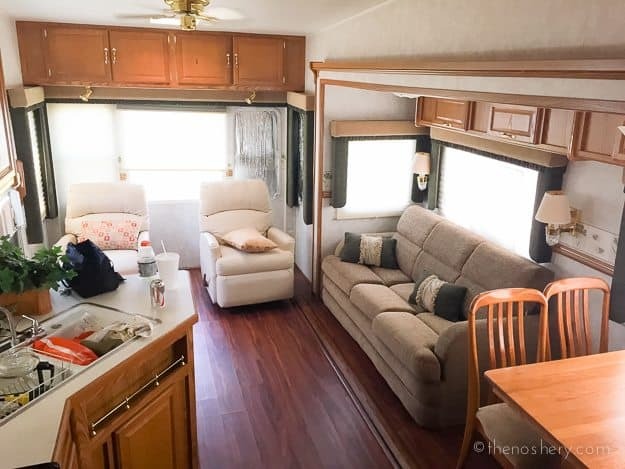 We moved into a house years ago but I miss the 5th wheel sometimes – so compact and neat. Congratulations!!! That’s so exciting! Can’t wait to see what you have in mind for this one. That’s a nice looking camper! btw, the bedroom is looking fine , it looks like a huge mattress , which mattress you are using exactly ? Congrats, I am very happy for you and the dogs. It will be fun to see the progress. Maybe you will be able to cook more things with the added space.